The Unwritten tells the story of Tom Taylor and his late father’s series of bestselling fantasy novels that revolve around a boy named Tommy Taylor inspired by his real-life counterpart… or was it the other way around? I’ve only read two volumes of the main series, but I definitely enjoyed the ever-increasing surrealism as the literary world begins to encroach more and more on Tom’s life. This volume, “The Ship That Sank Twice” serves as a bit of a prequel to the main series as well as a standalone retelling of the first Tommy Taylor adventure. The book consists of two alternating storylines – one in which Tom’s father begins putting together his plans for a media empire revolving around his son’s “mysterious” origins and another that follows the mishaps of his fictional creation. 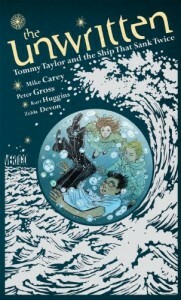 If the book was nothing but Tommy Taylor’s first adventure, it might feel like a bit of a re-tread; part of the joke of The Unwritten has always been that Tommy Taylor is a more cynical, clichéd analog of Harry Potter. Thankfully, Carey makes the Tommy Taylor story stand out a bit by playing with the tropes in interesting ways and leavening the proceedings with humor. One of my favorite moments in the book happens when a series of ever-larger animals discover the infant Tommy floating on the ocean and argue over who will get to eat him. As for the storyline that focuses on Tom’s father, it serves as a chilling counterpoint to the magical adventures of his creation. Tom’s father comes off as nothing but a cold-blooded manipulator, willing to destroy his marriage and the life of his son in the name of a long-term publicity stunt. This thread grounds the narrative and offsets Tommy’s magical adventures with a growing menace. The art throughout the book is gorgeous, and the layouts are oftentimes dynamic in ways that make the story jump off the page without impacting its readability. Mostly this book just made me want to dive back into the main series so that I could continue experiencing the odd story of Tom Taylor’s life. I definitely recommend this book, although I would also recommend picking up at least the first volume of The Unwritten first to get the full effect.